Inland Building Systems offers engineering expertise for all loading conditions, building codes, and design specifications. We can provide a complete building structure for your firm. 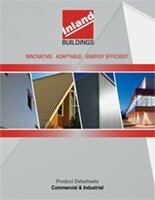 The Inland name has long been recognized as an industry leading supplier of custom engineered metal building systems. to give every customer the greatest investment value possible. At Inland, we measure our success by our customers’ success! Satisfied customers are perpetuated by outstanding customer service. Combine your people and your resources with Inland’s qualified associates and partners and you will discover a rewarding experience. The result will be an industry leading product…on time…within budget. Doors, Windows, Vents, Skylights, etc.